In the fast-paced world of 21st century manufacturing, companies are looking to be more nimble than ever. They need to react at a moment’s notice and be sure the information they disseminate is accurate, secure and delivered to the proper people and of course delivered on time. Product Lifecycle Management solutions such as Teamcenter have helped vastly in making sure the information is accurate, but it can be a very time-consuming process in many instances arranging, packaging and delivering sensitive documentation to Customers, Vendors, Partners and Regulatory Authorities. SEAL Systems’ Document Distribution Platform for Teamcenter, DDP4TC, is an embedded solution in Teamcenter that enables modern companies to quickly and efficiently share documents. With just a few mouse clicks hundreds, even thousands of documents can be converted to a safe, secure format, stamped and watermarked with the appropriate markings for Regulatory Compliance or other issues, arranged into booklets with table of contents, page numbers and more, or left as separate files, and then delivered to whomever your company requires. DDP4TC uses Templates built and accessed either manually or completely automated through Teamcenter Workflow events. These Templates ensure the correct documents are compiled and delivered each and every time. Recipients can easily make changes, either redlining PDF files or secured CAD files, but never accessing native data unless you deem it necessary. A Differential Package can be sent back easily for edit and re-distribution. Crane Aerospace in Seattle, WA implemented DDP4TC and has since recognized a 50% increase in efficiency delivering sensitive Customer Submittals and Supplier Packages. See how they did it in a recent webinar on Teamcenter – View the recording now! Is SEAL Systems’ DDP4TC right for you? Register for our DDP Webinar on February 7, 2018 to learn more! Click here to register. 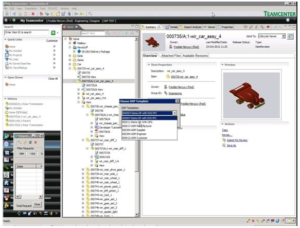 Do you have questions about document package distribution from Teamcenter PLM? – Email Alex Hanga!